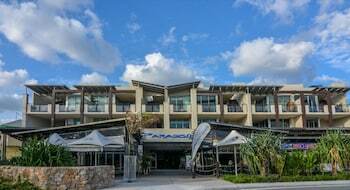 Located in Kingscliff, Paradiso Resort Kingscliff is on the Strip, within a 15-minute drive of Kingscliff War Memorial and Tropical Fruit World. The front desk is staffed during limited hours. Extended parking is available onsite. Located in Tea Tree, Charles Reuben Estate is a 3-minute drive from Zoodoo Zoo and 7 minutes from Pooley Wines. Free self parking is available onsite. With a stay at this cottage in Keith, you'll be minutes from Keith Swimming Pool and close to Keith and District Conservation Park. Free self parking is available onsite. Located in Blewitt Springs, Karawatha Cottages B&B is in a rural location, within a 5-minute walk of Geddes Wines and Beresford Wines Tasting Pavillion. Free self parking is available onsite.